general during his service as General of the Armies during World War I. More information about Pershing and the efforts to keep his memory alive can be found at www.pershingmuseum.com. The “General Pershing’s Pathfinder” Hiking group is VFOM’s new project. help the Vets in recovering from PTSD/TBI. group on a section-hike of the Ozark Trail (OT). Cuba, Missouri VFW Post 7147 will sponsor the first event to kick off the "Walking Off The War" hike on October 10th with a fish fry. On October 18, the Bunker Community invited the General Pershing's Pathfinders to participate in their Heritage Days and parade. On October 25, the hikers will be treated in Eminence by the Chamber of Commerce. On October 30, the Van Buren Chamber of Commerce invited the group to speak at their monthly meeting. Robert will speak about gain awareness of the trail, and the use of trail to help veterans. West Plains, Missouri VFW Post 1828 will sponsor the final community event to end the hike. Four events are planned during the four week hike, to get community awareness of the PTSD/TBI challenge with veterans. We will meet at the Boathouse at 9:00 am. Come be a part of the exciting venture. The first veteran group on a section-hike of the Ozark Trail (OT). Thanks to Wes Johnson for joining the veterans on the Ozark Trail, and for writing the wonderful article. 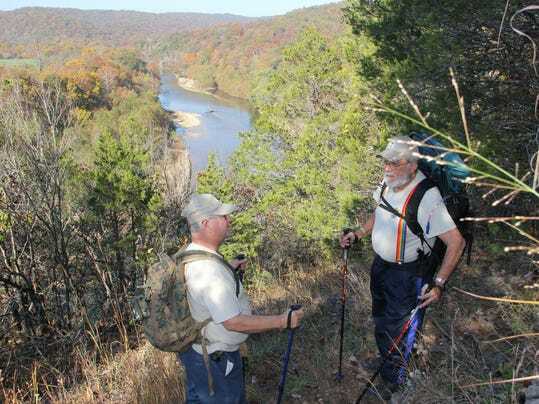 Veterans that are interested in joining the General Pershing's Pathfinders 2014 Ozark Trail Hike can send an email to: robertcrampton91@gmail.com. This hike will be limited to ten hikers. VFOM is partnering with Nixa VFW Post 6758 and American Legion Post 434 to develop recreational events for Missouri Veterans. We now see the need to work with the returning Vets who are challenged with PTSD/TBI (Post Traumatic Stress Disorder and Traumatic Brain Injury). In helping them to adjust in returning to happier home life, we will give them a way to give back to the community. It has been demonstrated that hiking and working in the woods will aid in the recovery of these Veterans. We will be collecting information on the Vets needs and teaching them a basic trail building skill program. This will help them in their recovery from PTSD/TBI. I have worked with a number of trail groups regarding to trail building and Vocational Trail Building programs that will tie into the new unit of VFOM. The “Pershing’s Pathfinder” Hiking group is our new project. This group will do local hiking and learn basic trail building skills: “Walk off the War “Program. Thanks to our veterans that helped out at the three day event. Made many contacts with local veterans. Getting the face of Pershing in front of the public. Volunteers For Outdoor Missouri, Inc.